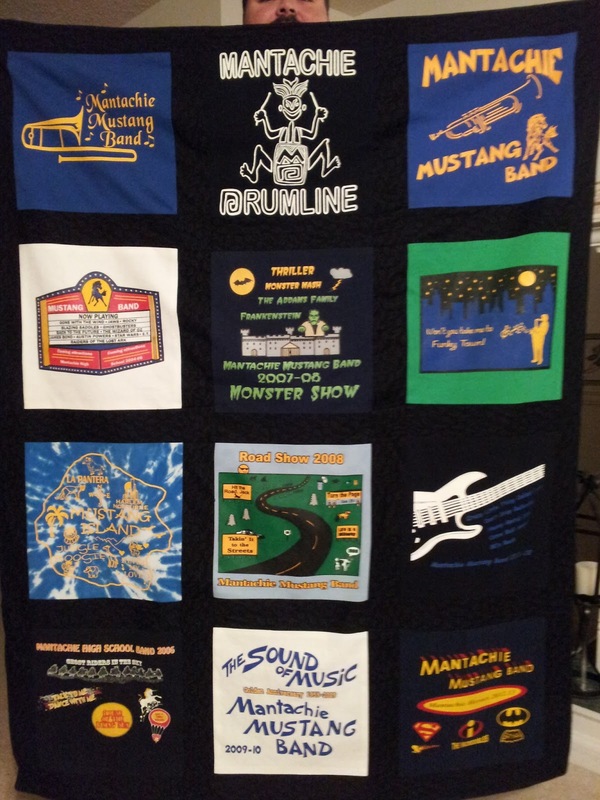 T Shirt Memory Quilts made by YOU! I am so grateful for the opportunity I get to work with my customers. Today I’m sharing their creations! The first blanket was made by Shelley. 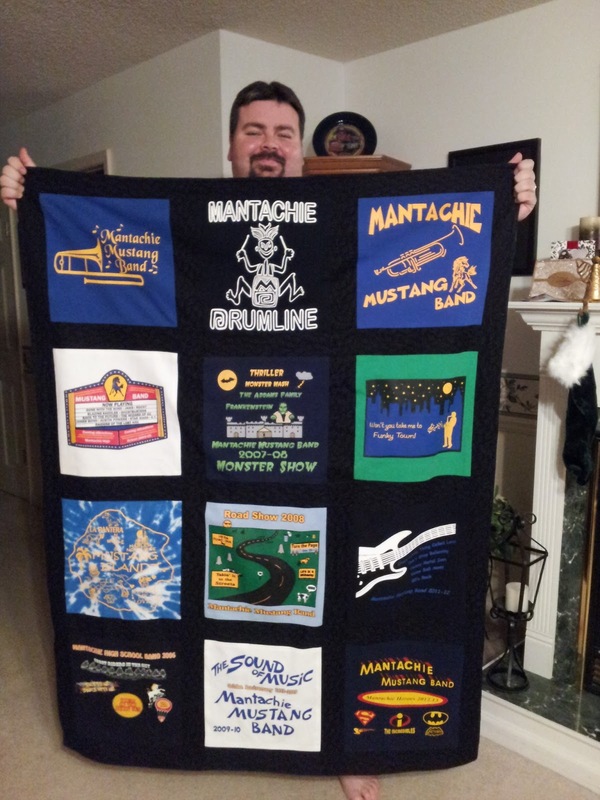 She purchased a T Shirt Quilt Kit from me and made this wonderful present for her husband! I enjoyed working on this project so much! My mother helped me get started and gave me tips throughout; I used her sewing machine for the first time in several years! She was delighted to see me sewing, and we had a great time together. I plan to do a few more little sewing projects this year with her help! “The pattern was very easy to follow and I had no problems at all! 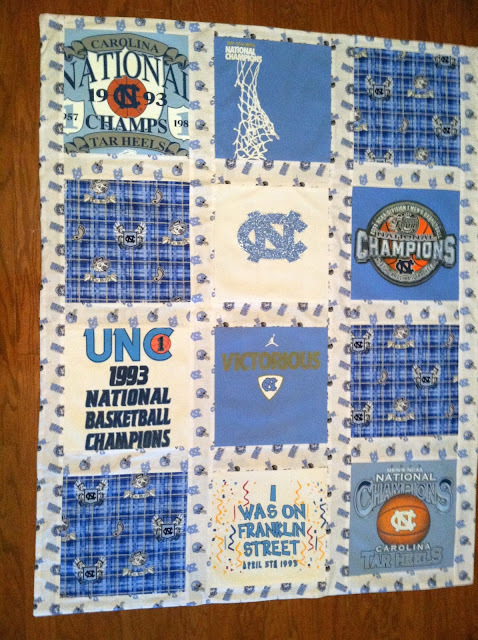 I don’t typically make quilts of any kind, so I was a little scared, but it was super simple! The only thing I’ll do different on the next one is cut the long sashes a couple inches longer. (I think the pattern called for 62”). When I started sewing the long rows together, the long sashes were about an inch too short. 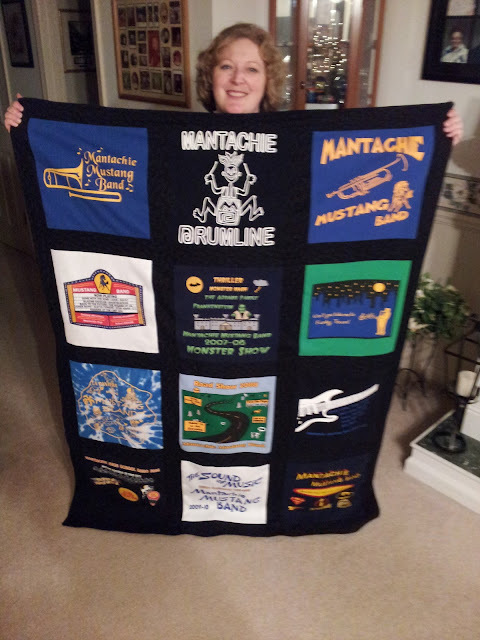 I’m sure this was because of my error in stitching. If you’ll notice on the picture, the width of the top and bottom sashes are a little smaller than the sashes in the middle of the quilt. I had to cut them down to make it even. I only had 8 shirts, so I used other fabric to fill in the other 4 squares. I think it took me a total of 5 hours to put it together, but I know exactly what I’m doing now. It shouldn’t take me so long next time. I am proud of these women who created these blankets and hope that they have discovered the joy of sewing and creating unique items! I love that Shelley mentions working with her mother. My mom doesn’t sew but I remember my mother-in-law helping me with my first pattern when I first got a sewing machine. These are wonderful shared moments. Such a treat to see the finished blankets! They look great! Such nice comments from your happy customers!